Happy Friday! Since it is Friday, it is time for a new post in my NYC Friday series. While in New York, I visited Chelsea Market. Chelsea Market is an enclosed food court, shopping mall, and office building. It is home to the Food Network and houses studios for Food Network shows, such as Iron Chef and Emeril Live. Neatly enough, Chelsea Market was built in the old National Biscuit Company where the Oreo cookie was invented and produced. I was really hoping to sneak a peek of the Food Network, but it is not open for tours. Chelsea Market is quite the cornucopia of food, and it was very fun to explore! Since this post was preceded by devil's food cupcakes, the "evil" theme continues, and today's post is about Fat Witch Brownies. Fat Witch specializes only in brownies, and they bake and sell over 2,000 brownies daily. Each brownie is a "witch," and there are many types of witches, such as caramel witches, snow witches, and breakfast witches. If you're going to make a brownie, you might as well go big, right? 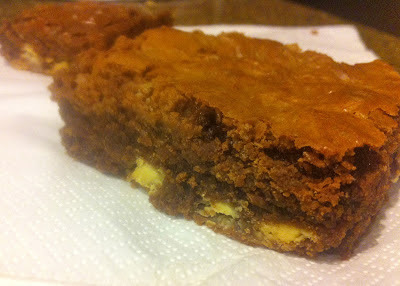 So, meet triple chocolate brownies. These brownies were intensely rich and fudgey. Near the end, you stir in white chocolate and milk chocolate chips. I liked that "technique" because then you can really taste the distinct flavors of chocolates since the chocolate chips don't dissolve into the batter. I have a confession to make. When I first tried one of the brownies after they cooled, I did not think that they tasted chocolatey enough and felt almost a little disappointed. I tried a bite the next day and entered into a chocolate coma. The brownies tasted better the next day. I'm not sure why, but maybe it gave the three chocolates more time to meld together and deepen in flavor. Preheat oven to 350ºF. Grease a 9 x 9" baking pan with butter or cooking spray. In a small bowl, mix the flour and salt, and set aside. Combine the butter, bittersweet chocolate chips, and 1/4 cup of the milk chocolate chips in a small saucepan. Melt together over low heat, stirring constantly. Set aside and allow to cool to room temperature. In a separate bowl, beat the eggs, sugar, and vanilla until smooth. Add the cooled chocolate mixture and continue beating until well blended. Next, sift the flour mixture directly into the chocolate batter. Mix until well combined, with no trace of dry ingredients. Gently stir in the white chocolate chips and the remaining 1/4 cup of the milk chocolate chips. Spread the batter in the prepared pan. Bake for 30 minutes or until a tooth pick inserted comes out clean. Remove from the oven and allow to cool on a rack for at least 1 hour. Triple chocolate makes me triply happy. Can I be triply? I'm not sure to be honest but I'd happily make these brownies to find out.